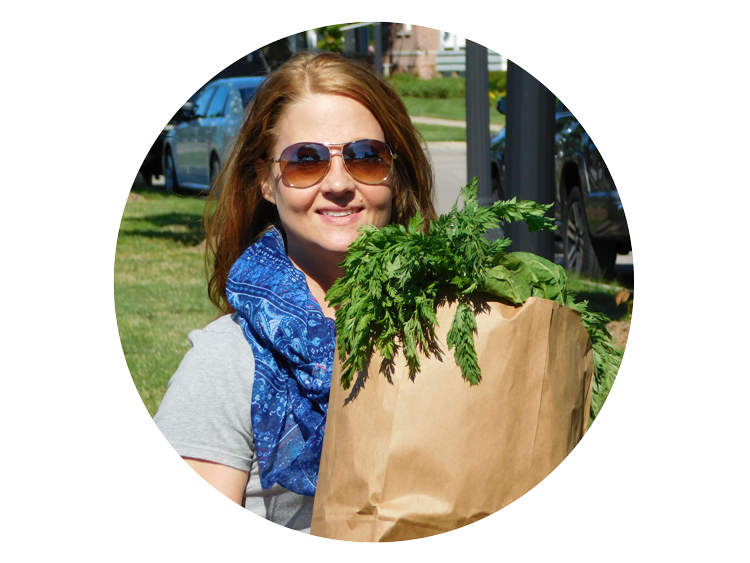 I came up with this recipe because I had only one pound of chicken breasts on hand, and with a husband and two teenagers to feed, a pound of chicken is not going to cut it. 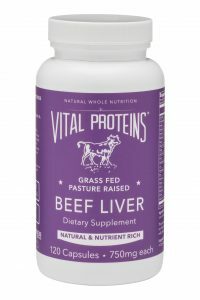 So, l wanted to make something that would help stretch that pound of chicken into a meal, but not skimp on protein, be super healthy, and fit into our low carb/keto lifestyle. 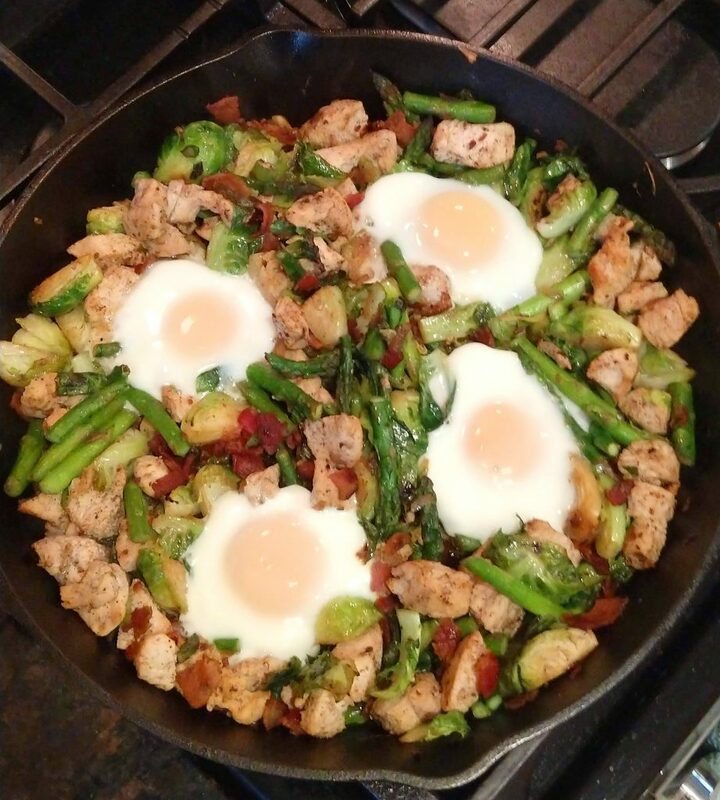 Adding a few eggs and some fresh Brussels sprouts and asparagus, and we had dinner! 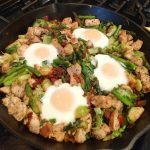 I love this recipe for breakfast or brunch too! 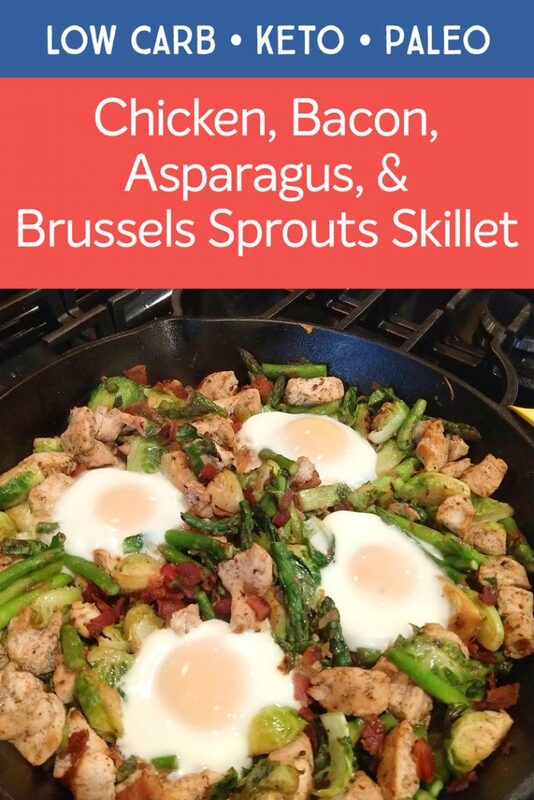 I recommend using a cast iron skillet for this recipe, because not only is cast iron a great non-toxic cooking option, but it can easily go from stovetop to oven! Preheat oven to 375˚. Cut chicken into 1- inch pieces. Chop bacon and cook in a cast iron skillet* over medium heat until crisp. Add the chicken and cook until nearly done. Don’t overcook (it will bake more while eggs are cooking)! Keeping bacon grease in pan, remove chicken and bacon, and set aside. Add additional oil to pan if needed. Add onion to pan and cook until translucent. Add Brussels sprouts. Cook for about 5 minutes, stirring occasionally. 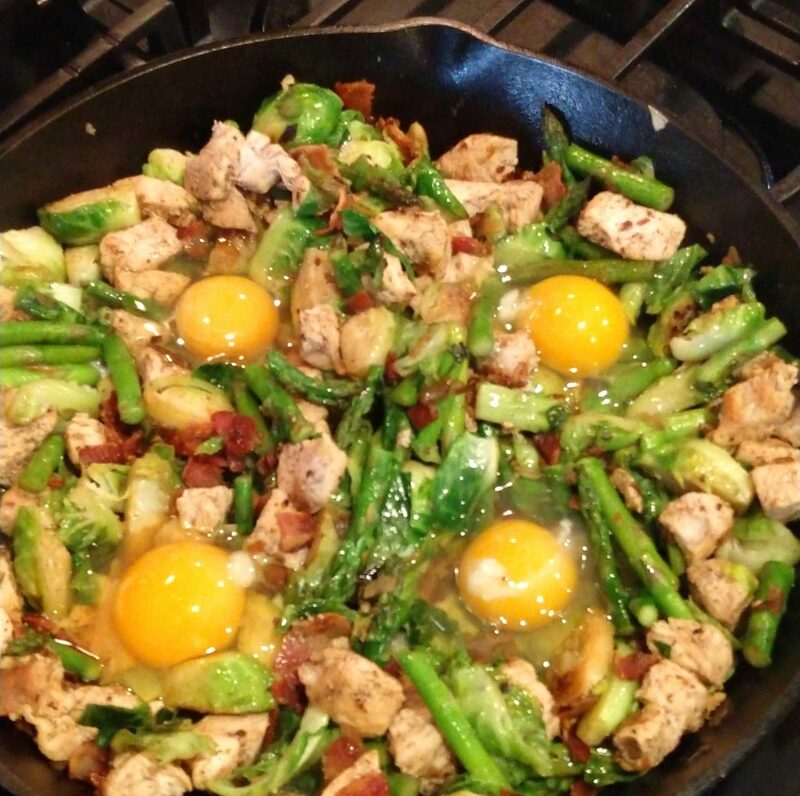 Add asparagus and continue cooking for an additional 5 minutes, or until veggies are mostly tender. Then add chicken and bacon and combine. Add salt and pepper to taste. 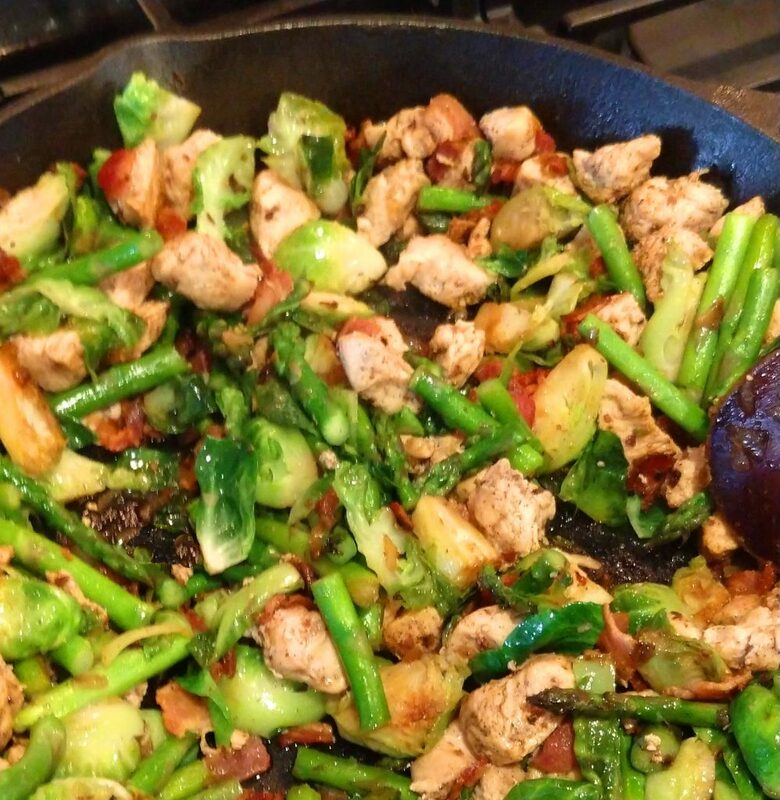 If veggies are sticking to pan, add a teaspoon or two of oil. Make 4 wells in the mixture so that you can see the bottom of the pan a bit. Crack an egg into each well. Cook for a few minutes. Then transfer skillet to the oven. Bake for 10-15 minutes until the egg whites are set. While skillet is in the oven, make the hollandaise sauce. Whisk egg yolks, water, and lemon juice over low heat. Whisk almost constantly. When mixture starts to thicken, temporarily remove from heat. Add a small amount of softened butter, and continue whisking, returning to burner periodically to help maintain temperature without overcooking. Whisk in remaining butter one tablespoon at a time. Remove from heat. Add a pinch of salt if desired. After 10 minutes or so in the oven, when eggs are set, remove skillet. 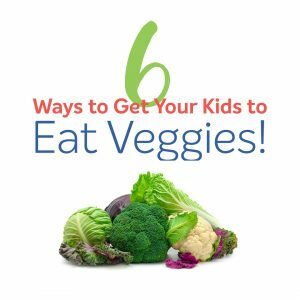 Place one egg along with chicken and veggies on each plate. Top with hollandaise sauce. 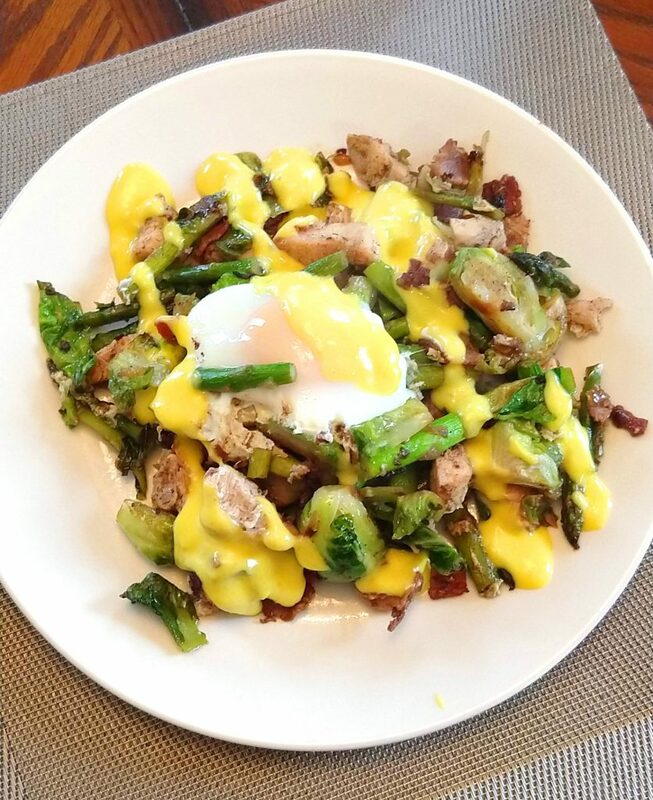 Delicious low carb, keto, and paleo skillet meal with chicken, bacon, asparagus, Brussels sprouts, eggs, and hollandaise sauce. After 10 minutes or so in the oven, when egg whites are set, remove skillet. 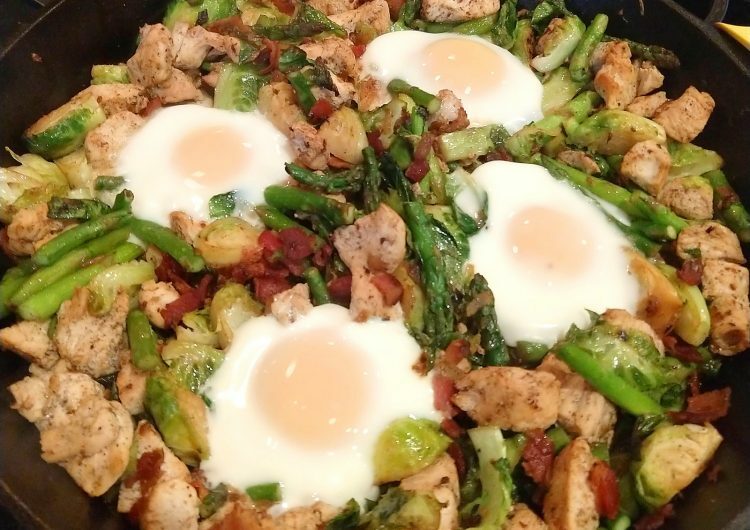 Serve by placing one egg along with chicken and veggies on each plate. Top with hollandaise sauce.